The Ministry of National Security and the Department for National Drug Control [DNDC], in conjunction with treatment agencies across the island, will celebrate National Recovery Month during September 2016. A spokesperson said, “This year will be the 27th Annual Recovery Month observance spearheaded by the Substance Abuse and Mental Health Administration [SAMHSA] in the USA. The DNDC will use this month to educate Bermuda about substance use treatment and mental health services, which can enable those with a mental and/or substance use disorder to live a healthy and rewarding life. 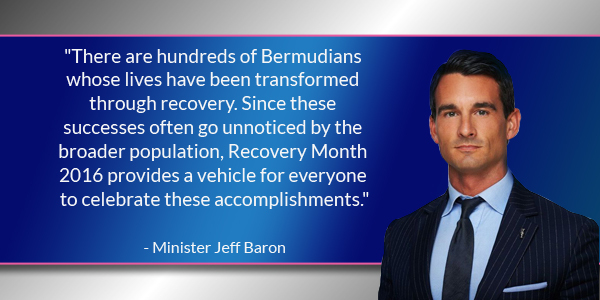 Minister of National Security, Senator Jeffrey Baron said, “There are hundreds of Bermudians whose lives have been transformed through recovery. Since these successes often go unnoticed by the broader population, Recovery Month 2016 provides a vehicle for everyone to celebrate these accomplishments. “Each September, millions of prevention, treatment, and recovery programmes and facilities around the world celebrate National Recovery Month. They speak about the gains made by those in recovery and share their success stories with their neighbours, friends, and colleagues,” continued Minister Baron. “In this, its 27th year, Recovery Month highlights the achievements of individuals who have reclaimed their lives in long-term recovery and honours the treatment and recovery service providers who make recovery possible. It also promotes the message that recovery, in all of its forms, is possible; and encourages citizens to take action to help expand and improve the availability of effective prevention, treatment, and recovery services for those in need. “This month, is an opportunity to celebrate those individuals and their families who are committed to living a healthy and drug free lifestyle. “And there are numerous activities planned for those in recovery and those professionals servicing this special population including a football game, a special family and client event, and the BACB Councellor of the Year Award ceremony.